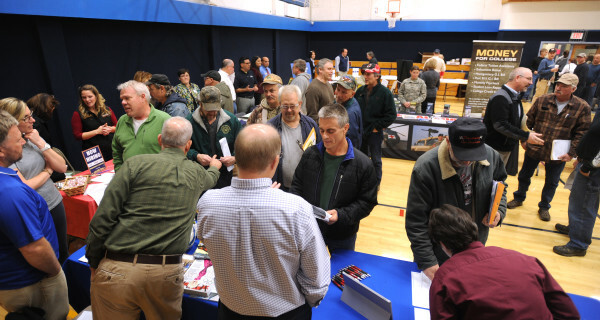 More than 40 employers and training providers were present at a job fair organized for millworkers who were laid off from the Verso Paper mill in Bucksport in November 2014. Since the Great Recession, Maine has seen a meager recovery — second only to West Virginia. Since August of 2010, Maine saw modest growth in employment — 2.66 percent since the lowest point of the recession. That ranks us 49th of all states, in an analysis released by Pew Charitable Trusts today. To calculate job growth, Stateline identified each state’s lowest level of employment since January 2008 (the recession officially began in December 2007), and compared that figure to the state’s March 2015 employment level, the most recent number available. The average state (including Washington D.C.) enjoyed an eight percent increase in employment. The state that by far had the greatest increase was North Dakota, with an economy bolstered by oil production. West Virginia tailed the report with 2.16 percent job growth. Since the recession, Maine has created 15,700 jobs, and employment in March 2015 was 605,900, according to the report. To see the details of the report and other states’ performance in an interactive graphic, visit Pew’s site.